This book contains these articles: 1) Chasing the Rainbow in Iraq - 42nd Infantry ‘Rainbow' Division - Task Force Liberty Carl Schulze, an intrepid combat photojournalist, has prepared this in-depth article on the 42nd ‘Rainbow' Infantry Division operating in Iraq in OIF III. 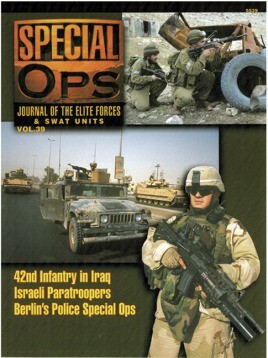 Unfortunately, due to sales rights restrictions, we cannot offer 5539: Special Ops: Journal Of The Elite Forces Vol 39 for sale in your country. Carl Schulze, an intrepid combat photojournalist, has prepared this in-depth article on the 42nd ‘Rainbow’ Infantry Division operating in Iraq in OIF III. Uniquely, this division was the first Army National Guard unit to be given its own Area of Operations in central Iraq. This extensive feature article provides the reader with all the information they need about this division, while the photos showcase a bewildering array of equipment being used. Included are infantrymen and their personal weapons, M1 Abrams tanks, Bradleys, M113s, M109 howitzers, helicopters, and the usual range of Humvees and trucks. This is an excellent summary of an ARNG unit in action, as well as a colourful portrayal of the equipment being used by National Guard units in Iraq. Of any military force in the world, few nations can equal the combat experience of Israel. And amongst the elite of the IDF are its paratroopers, also known as ‘Tzanhanim’. This article offers a special insight into this extraordinary group of soldiers as they train and patrol in defense of their besieged nation. The text traces the background and development of the IDF paratroopers, while the accompanying photos show the typical style and variety of uniforms, equipment and weapons currently employed in paratroop units. This article provides a rare inside look at one of Israel's best combat entities. For any job that the average Berlin police unit cannot handle, there is LKA 632, a special operations unit of the capital's police department. They train to extraordinarily high standards so as to be ready for any eventuality, whether criminal or terrorist. This article offers a firsthand insight into this small, elite unit, meaning their weapons and uniforms are on display as personnel are put through their paces.